27th September 2012. Discover what's just new in the EO Shop; get the scoop on the new Super Specials; read about the new site developments; and more... here in our latest newsletter. Here's some interesting facts - did you know the ExplorOz Forum has over 98,000 threads? All of these can be searched & read, but once they become inactive for 30 days, no more replies can be added. You might also be surprised to know that the total number of thread page views is over 2 million per month, which is 46 pages opened per minute! That's a huge amount of information and traffic in this section of the site, so last week we completed some major upgrades to our database to enhance forum performance. You'll also notice the new-look Post Reply and Post Follow Up pages with easier to find buttons and an even better preview/edit function. Feedback so far is very positive. What do you think? One of the key privileges of being an ExplorOz Member is receiving an exclusive webpage called your Member Profile page. This page is created automatically the moment you join and integrates everything you publish using the site's Member tools into a page that's all about you and your adventures. You can also add information specifically to this page. Are you getting the most from your Membership? It's easy. Store & display your photos (unlimited), a customised map showing all the Places you've reviewed/added photos to, or created will appear automatically (My Map), your EOTrackMe map, plus your User Treks (uploaded track files), and your Blogs. It's all grouped together on your profile page. These pages enable you to easily document & share all aspects of your trip/planning - like having your own website. Do this for your own records, or do it to share. It's your choice. We've recently added share buttons, so now you can easily point all of your friends and family to your page. Simply email them the link, or post the link via Facebook or Twitter, and let everyone know how to easily access your personal ExplorOz page! Click the orange "My Profile" tab to add/edit details to appear on your Profile Page. To view your changes, click "View Public Profile". If you don't have a Profile - why not Join today! With an ever increasing hand-picked product range, personalised customer service, and efficient delivery, the ExplorOz Shop is THE place to buy everything you need for trip planning and navigation as well as some great vehicle and outdoor gear to use while on the road. But don't just take it from us - when we introduced our new review system, we enabled a review function on the Shop Home Page so that our customers could publish their opinions on our service - see what they said here (scroll down to see reviews). Aquire a small profitable business with huge potential. Sell campers featuring a revolutionary patented design. Full installation in under 2 minutes, integrated tropical roof & annex, plus tough & light rust-proof molded components. Ready to start trading, demo models available view the Dealer Ad in the Classifieds to find out more & how to contact the seller. 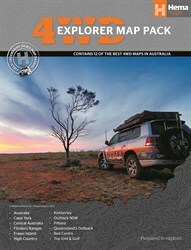 Previously known as the 4WD Destinations Map Pack this is a must have item if you're planning a trip around Australia. Plus you save over $25 by buying pack instead of the individual maps! Have you considered joining as a business member? Do you want to promote your products/service? Do you want to see your brand advertised on these pages? You can view our rates & options here or email info@exploroz.com to discuss your needs.